NOTES: Converted with additional replacement nose. In 1950 Westland concluded a license agreement with Sikorsky covering the manufacture of the S-55 for the British forces and other nations. Initially the Royal Navy received 25 x S-55 under the MOAP and this was followed by production of the type to become the mainstay of the rotary wing element of both the Royal Navy and the RAF in the original piston-engined form. The Whirlwind HAR Mk1 was the Royal Navy version with R-1340-40 engine. The same version for the RAF was HAR Mk2. In due course there was a long list of HAR varieties until the first turbine engined Gnome 177000 HAR9. 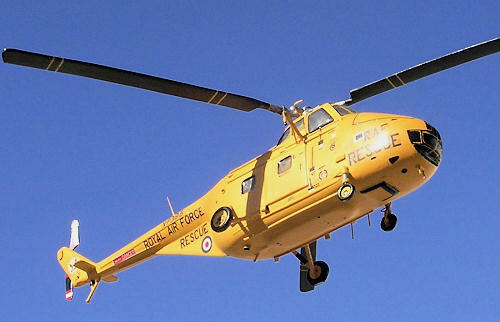 This was a conversion of Whirlwind HAS Mk7 for use in Search and Rescue and ice-patrol duties. The version HAR10 was the type for the RAF. It was the new production with Gnome H 1000 engines, in addition to some conversions of HARMk2 and HARMk4 to same power plant. The HAR10 turbine-engine was immediately recognizable having an elongated nose profile which entered service in 1961. Many of the turbine-engined Whirlwinds were conversions of earlier piston-engined type proving the soundness of the original design. The Whirlwind HAR10 was long on my list of subjects for conversion and when the revised Airfix kit appeared years ago that was a vast improvement on the original Airfix kit issued previously in BEA markings and without window transparencies, this was to be the base on which to build my HAR10 . In fact my kit was again a re-issue of the improved Airfix Whirlwind. 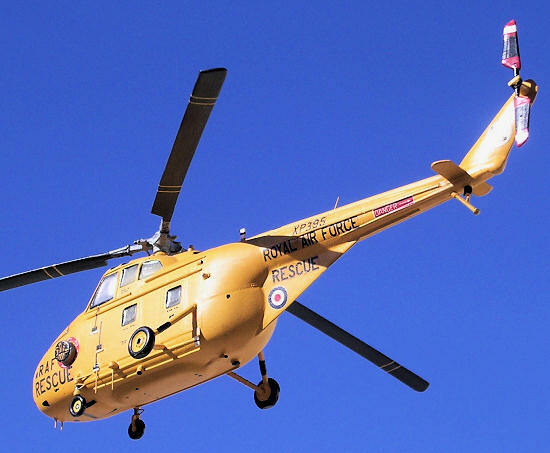 This had RN markings to be built as a Mk22 and with alternative markings for a USAF rescue H-19. The kit was injected in silver plastic having parts for the fuselage, prop blades, cabin interior floor, bulkhead, seats, columns, crew figures, undercarriage struts, tail rotor, winglets, wheels etc. Starting with a good set of reference scale plans from Aviation News series of drawings one could note that the principal part of conversion to HAR10 was the elongated turbine-engine nose and the cranked tail-boom that originated with the introduction of Alvis Leonidas engine type. There are two ways of how to go about building a new nose for the HAR10. It can be curved out of solid wood, or alternatively one could make a plastic card pattern from side view and add 2 or3 cross-stations in form of bulkheads and once these are joined with the central section these are filled and built up with Milliput. I opted for the former method which involved curving a new nose from yellow pine. This is the ideal wood used for wooden patterns as it has no shrinkage and warping problems, it is free from knots and is soft and easy to work with. Having shaped the wooden nose this was then smoothened with fine sanding paper and then applied a coating mixture of talc powder mixed with a quantity of Humbrol cellulose dope. This was applied in two coats, rubbing down with fine sanding paper in between coats. The next stage was to prepare the fuselage from the Airfix kit in order to take the new nose section. The fuselage halves were held together with scotch tape and make a vertical cut across the nose section and at the tail boom area. The nose was cut just ahead of the windscreen and the tail boom was cut at an exact spot where there was a pronounced downward ‘crank’. It was imperative to make frequent reference to scale drawings when marking for cutting. The aft fuselage was cut vertically from top of the tail boom, and then removing a tail boom fillet and later rejoined the section from the cleaned-up edges, which were faired smooth by a small amount of filler followed by sanding. The kit dorsal spine was filed away and a new one made from plastic card fitted instead. The rear of engine compartment was also built up with filler, as the shape of the kit area was too flat. A beacon light was fitted on this area. The tail boom stabilizer was also enlarged by inserting a 1/8 inch narrow plastic strip, this was filled with filler at the joint and then filed to shape. A new tail unit was made from a thick scrap piece of plastic as this had a totally new shape to the kit part. The main propeller blades were also built from plastic card, as the kit prop was 1mm narrower. The blades once shaped were glued to the central part No23. A new aft stabilizer replaced the kit part No33, which was fitted in level position instead of an inverted Vee shape. Tail rotor was scratch built from plastic card as the kit one was short and narrow. The assembly starts by assembling the cockpit floor and the rotor transmission of the Airfix kit. This was painted light gray and allowed to dry. The cockpit side windows were also enlarged as these appeared slightly under size when compared to scale plans. Instrument console, seats, crew figures etc were all painted and fitted in place. The fuselage halves were closed and cemented. A firewall made of 1mm plastic card was added to the front to close the cut open section and the prepared replacement nose was aligned and fitted to it using small amount of super glue. I thought of adding a couple of guiding plastic rods at the inside for more rigid strong joint but found it was not required and I was happy with the firm complete fuselage front. The seam was sealed with more talc powder and dope mix followed by smooth sanding. With the nose and tail boom in place the next stage was adding the three small aerials to the lower fuselage and three antennae added to the fuselage at different places, tail bumper from bent wire and shaped plastic pieces and the stabilizers were added from the kit supply. The hoist/winch was fitted to the starboard side of cabin. Adding two pillar brackets made from stretch sprue modified this attachment. A heavy round engine exhaust was cut and shaped from a ballpoint pen cover that matched the diameter and then cemented to the fuselage. The tail boom also had detail added to its side in form of four external strips attached longitudinally along the sides. Front screen windshield and forward side window were fixed in place and masked. The remaining window apertures were masked with the capillary action of Maskol so that when airbrushing the kit the interior is not affected. The assembled fuselage was given an overall coat of matt white to reveal any imperfections and also as a base in preparation for the overall yellow finish of the kit. The rescue Whirlwind HAR10 was completed in the markings of No 202 Squadron RAF that was once based at Boulmer in UK as an SAR (1978). Another HAR10 with 84 Sq was based in Cyprus before the Sea King supplanted the Whirlwind in the SAR role. The kit was airbrushed overall in Humbrol gloss bright yellow. The masking liquid was then removed and window apertures were treated with Kristal Kleer glazing solution. This included the rear windows that were larger on the HAR10. This carried a colorful squadron crest depicting a flying swan on a white round background that appeared on the tail boom. Main propeller blades were painted black and dark green on the opposite side, with fine yellow stripes. Rotor hubs were silver. Propeller at tail area were also black and with red white red tips. Most of the black lettering transfers came from Clear-Fix Decals of East Sussex, UK. This sheet dealt with markings for the Whirlwind, Sycamore and the H-34. This was a Letraset type of decal but it could be aligned with ease. Alternatively one could also transfer the decals on a clear decal sheet and then onto the kit. 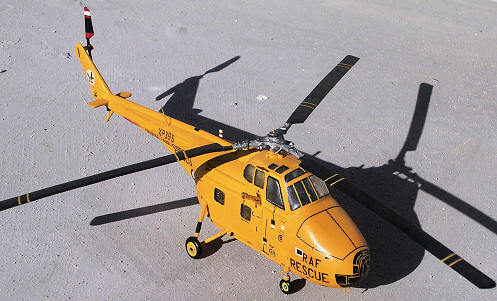 The tail crest came from the Airfix Sea King kit decal sheet. Nose engine detail was enhanced with black paint using a fine hand brush. This proved to be an interesting conversion adding a different shape of the Whirlwind sound design. This has also added a search and rescue helicopter to my section of 60s and 70s aircraft.